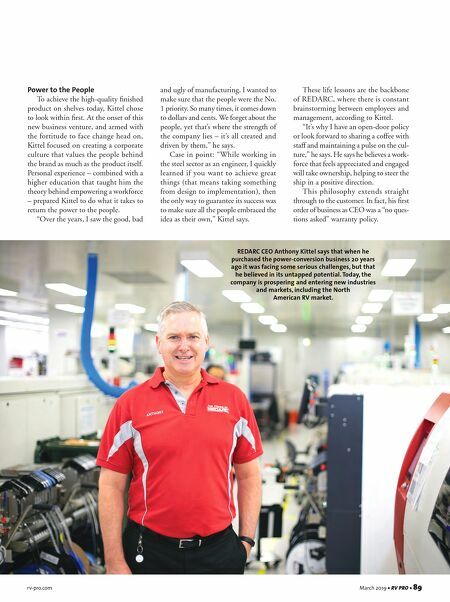 rv-pro.com March 2019 • RV PRO • 89 Power to the People To achieve the high-quality finished product on shelves today, Kittel chose to look within first. At the onset of this new business venture, and armed with the fortitude to face change head on, Kittel focused on creating a corporate culture that values the people behind the brand as much as the product itself. Personal experience – combined with a higher education that taught him the theory behind empowering a workforce – prepared Kittel to do what it takes to return the power to the people. "Over the years, I saw the good, bad and ugly of manufacturing. I wanted to make sure that the people were the No. 1 priority. So many times, it comes down to dollars and cents. We forget about the people, yet that's where the strength of the company lies – it's all created and driven by them," he says. Case in point: "While working in the steel sector as an engineer, I quickly learned if you want to achieve great things (that means taking something from design to implementation), then the only way to guarantee its success was to make sure all the people embraced the idea as their own," Kittel says. These life lessons are the backbone of REDARC, where there is constant brainstorming between employees and management, according to Kittel. "It's why I have an open-door policy or look forward to sharing a coffee with staff and maintaining a pulse on the cul- ture," he says. He says he believes a work- force that feels appreciated and engaged will take ownership, helping to steer the ship in a positive direction. This philosophy extends straight through to the customer. In fact, his first order of business as CEO was a "no ques- tions asked" warranty policy. 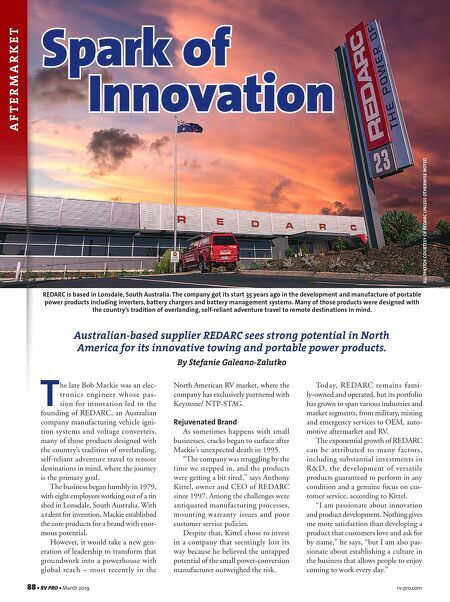 REDARC CEO Anthony Kittel says that when he purchased the power-conversion business 20 years ago it was facing some serious challenges, but that he believed in its untapped potential. Today, the company is prospering and entering new industries and markets, including the North American RV market.